The WITTMANN Group’s program of robotics innovation for plastics processors continues with the revamp of its W832 linear robot. The W832 is now configured to handle a payload of up to 25 kg. This 20% increase in performance in the W832 is described as “conservative” by Martin Stammhammer, Sales Manager Robots and Automation Systems. “An optional configuration of the vertical arm of the W832 model can handle up to 35 kg of payload for example for demanding insert applications”, he says. The WITTMANN redevelopment of its linear robot range is driven in part by the ambitions and usage patterns of its molding customers. “Many of our customers like to ‘push the envelope’ when it comes to performance from our equipment”, says Stammhammer. “They know that they can always rely on it that our robots will also provide quality results time after time. However, we need to make sure that our standard ranges are able for the most demanding customers and for the heaviest duty performance. 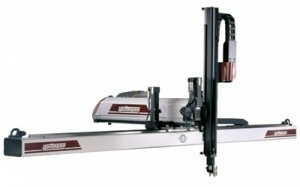 The W832 is therefore designed and engineered specifically for that up to 25 kg performance bracket, able for failsafe point accuracy, and as a special configuration, is fit for heavier end-of-arm tooling and other specifications.” The W832 is available with a maximum kick-stroke reach of 1,190 mm, a vertical stroke up to 1,600 mm and horizontal axes between 2,000 mm and 5,000 mm. The new W832 robot is ideally matched with machines of a clamping force of 400 to 800 tons, for example a WITTMANN BATTENFELD injection molding machine of the MacroPower series. WITTMANN worldwide is one of the leading manufacturers of robots and peripheral equipment for the plastics industry. The WITTMANN group with Headquarters in Vienna/Austria is a worldwide operating company with 7 production facilities and 20 branch offices in all major plastics markets in the world. WITTMANN’s product range includes robots and automation systems, automatic material handling with dryers and plastic recycling, temperature controllers and chillers for machine tools and volumetric and gravimetric blenders.